Picture postcards came into common circulation only in the years surrounding the Collinwood fire. Changes in photographic technologies and postal regulations initiated what historians call “the golden age of the postcard,” extending from 1905-1915. In 1907, The New York Tribune The cards hint at emotions–possibly hidden, sometimes revealed, or never even felt–in the aftermath of the Collinwood disaster. wrote that “souvenir-postal-carditis” was sweeping the nation. 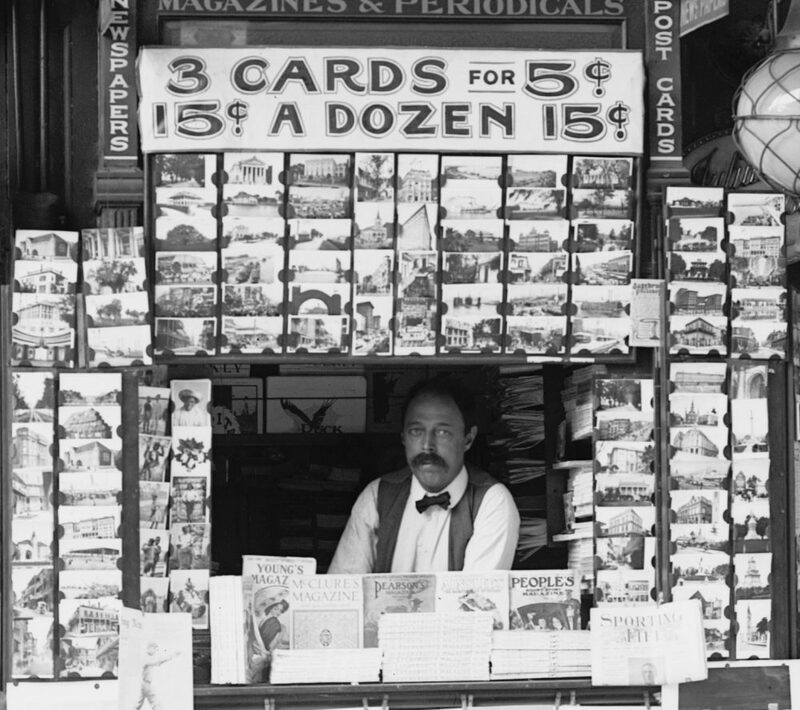 In 1910, people bought more than 2.3 million postcards per day in the United States. 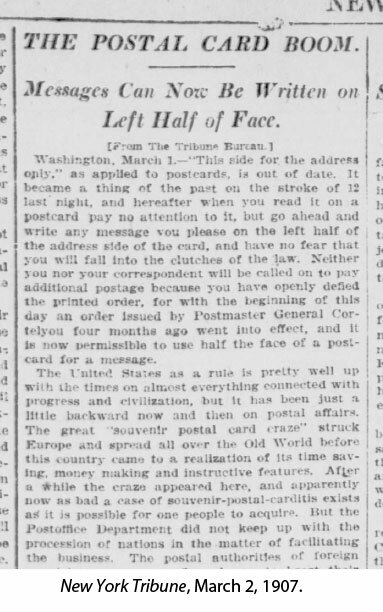 Buyers preserved and collected “postals” in albums, looked them over with friends, and, of course, mailed the cards as a quick way to keep relatives, friends, and acquaintances up to date without the trouble of composing a letter. 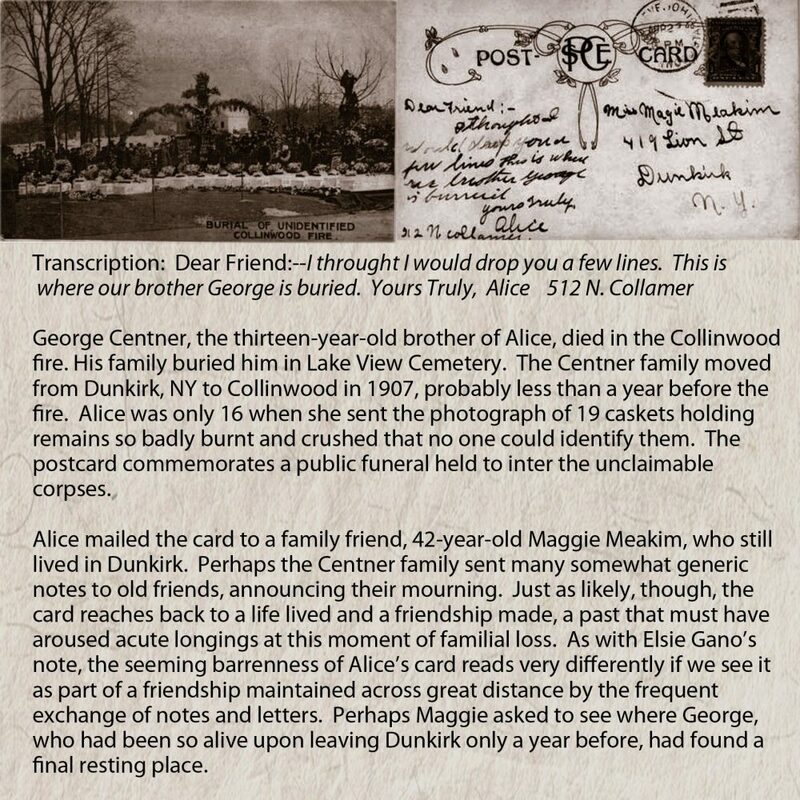 Rather than offering abstract thoughts or deep explorations of feeling, postcard writing affirmed relationships over distance through bits of news and updates on fragments of activity. The cards seem to have had their widest use among white women and children living outside the largest cities. Recent immigrants from Eastern and Southern Europe seldom sent them, and elite classes favored letter writing. For unskilled or uncomfortable writers, the cards must have been a particularly appealing way to stay in touch while moving the emphasis in communication away from words and toward pictures. Postcards often featured tourist attractions, but almost any event or image–from the pornographic to the childishly playful to deadly disasters–quickly landed on inexpensive “postals” and circulated via sidewalk vendors, drug stores, and specialized shops. In Jas. K. Stewart’s Smallest News and Postcard Stand in New Orleans, c.1910. LOC. 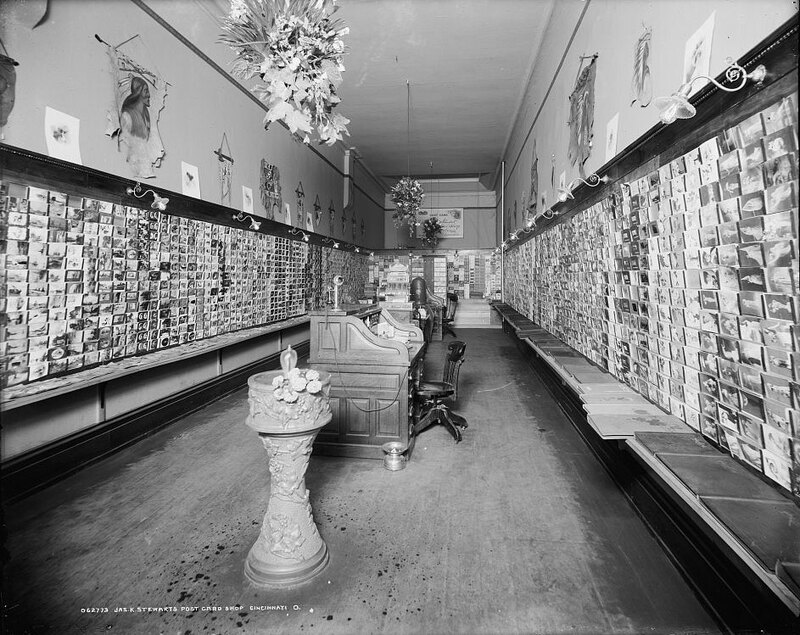 Cincinatti postcard shop, pictured in the background of this page, collectors’ albums line the shelf beneath long walls of cards. 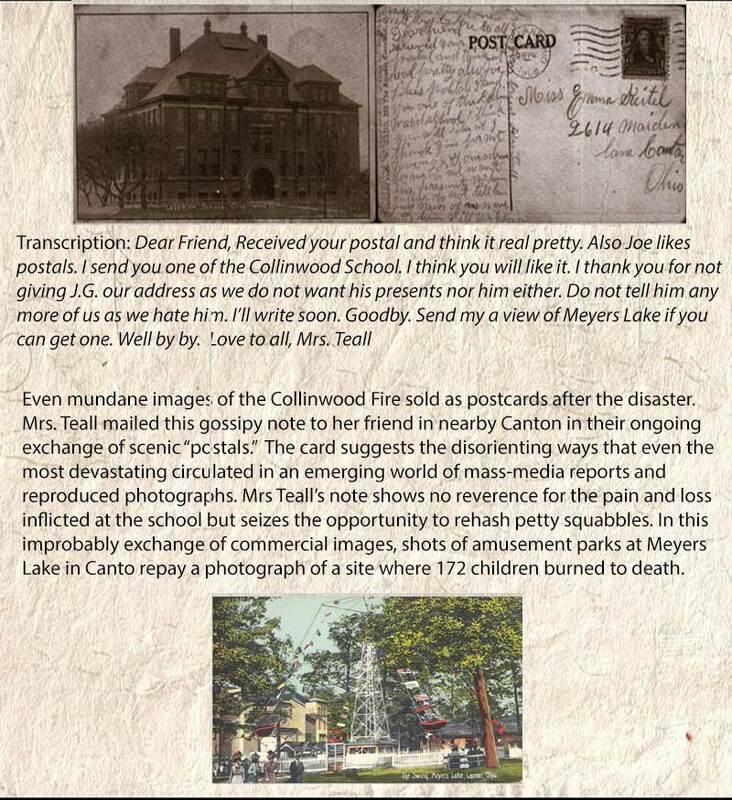 Most still surviving postcards from the Collinwood fire were probably collected and preserved in similar books. They have no writing or stamps on them. People living in the Cleveland area, though, did mail the three examples above. 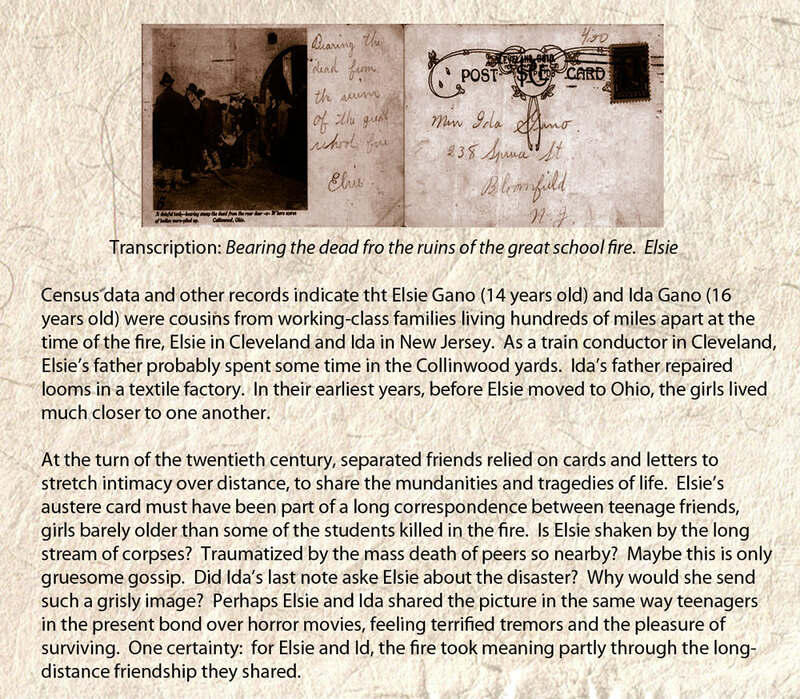 The notes on them show the haphazard sharing of experience that accompanied the postcard boom, but the cards also hint at emotions–possibly hidden, sometimes revealed, or never even felt–in the aftermath of the Collinwood disaster.